Torticollis is a condition that occurs when an infant’s neck becomes twisted, causing his or her head to tilt to one side. The twisting in the neck is caused by a shortened sternocleidomastoid (SCM) muscle. Other terms for torticollis include wry neck or loxia. Torticollis falls into two categories: congenital torticollis and acquired torticollis. Congenital torticollis is the most common type of torticollis. It occurs in less than 1-3.9% of infants. It usually occurs as a result of abnormal positioning in the womb or a difficult birth which stretched the SCM muscle, or the muscle that extends down the neck. Signs typically become evident within the first 8 weeks of life. Acquired torticollis has its onset in infancy or later childhood. It usually results from an injury or inflammation in the sternocleidomastoid or trapezius muscles. Because congenital torticollis is the most common form, it will be the focus of our practice area. A flattened area or an asymmetrical shape (positional plagiocephaly) on one side of the head from always sleeping on that side. This condition could also be caused by crowding in the womb, however. Because the causes of torticollis can be severe, it is imperative that signs and symptoms be reported to a medical professional. The doctor will conduct a physical examination, followed by x-rays, imaging tests, and ultrasound scans when necessary, in order to determine the cause of torticollis. Muscular torticollis is usually mild and will resolve after a few weeks with treatment of assigned exercises that can stretch the SCM muscle. These exercises involve specific moves as the doctor instructs. They may include ways of encouraging the infant to turn his or her head to the side that or she doesn’t normally turn to. This may mean laying the infant down on the changing table or crib so that people approach on the side they don’t normally turn to. Parents may also be encouraged to feed the baby more often on the side they wouldn’t normally turn to. Finally, giving the infant the proper amount of tummy time will also help to solve their muscular torticollis. If necessary, a doctor may refer a patient to an orthopaedic surgeon or physical therapist. The majority of cases of congenital muscular torticollis resolve within weeks with the performance of these exercises in accordance with medical advice. According to the American Academy of Orthopaedic Surgeons, approximately 10% of children with congenital muscular torticollis will require surgery to lengthen the short sternocleidomastoid muscle. Tomczak, Kinga K, and N. Paul Rosman. “Torticollis.” Journal of Child Neurology, 2012, pp. 365–378. Children with injuries like torticollis often go on to require specialized medical and care resources. If you believe your loved one was permanently injured or disabled as the result of medical negligence, you may be entitled to compensation to help support your loved one’s needs. 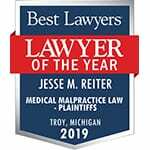 Reiter & Walsh, P.C. is a United States law firm specifically handling pregnancy, labor and delivery, and newborn medical malpractice cases. To learn more about your potential case, you may contact our team for a free, confidential birth injury case review.